Surfers Paradise Hotels for Families, Singles, Couples and Overseas Visitors. There are about a dozen hotels in Surfers Paradise Australia, so you would think it would be fairly easy to choose. For example, there are two Marriott hotels, but they are both very different. Which should you choose? Hotel, Hotel or Apartment Hotel? What do I mean? Hotel has several meanings in Australia. For starters in Australia hotel also means pub or bar. You don't want to end up in pub accommodation over a noisy bar, do you? And what about apartments? Which should I choose: hotel or apartment? Read more.. There are about a dozen real hotels in Surfers Paradise ranging from 3 star to 5 star with a range of facilities. You can see where they are on this map. My definition of a hotel is any accommodation that has hotel style rooms. That means one room, or interconnecting rooms, with bathroom, no kitchen and with other hotel-like faciltiies. 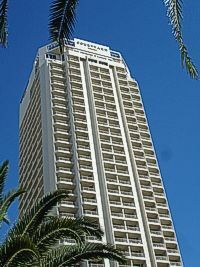 In addition to the hotels in Surfers Paradise, there are many resort apartments. When you are trying to find accommodation it can be hard working out which are hotels and which are apartments! Hotels are usually a safe option when travelling to somewhere you don't know well, but there can be vast differences between a 3 star hotel and a 4 or 5 star hotel in Australia. When I search for accommodation, I tend to look for types of accommodation by rating, price range and by facilities or features. Such as kid friendly, tennis courts, indoor pools or even private spas! You will find a similar structure below to help you choose a hotel in Surfers Paradise that's good for you. If you don't find an answer to your question about Surfers Paradise hotels, drop me a line and I'll see if I can help you out with an answer. Most likely it will be useful to other visitors too, so don't be afraid to ask if I haven't covered it yet. An apology for the length of this map! I wanted to make it big enough for you to see the detail, but Crowne Plaza Hotel and Crowne Plaza Gold Tower right down here! They are between Surfers Paradise and Broadbeach. As you can see that is quite far away from the main centre of Surfers. This map really highlights that. Don't forget them down the bottom here! They are both good options as long as you are aware of their position. You can check out these hotels in Surfers Paradise in the map, or click on these links to find out more about each one. Not Sure You Want To Stay In Surfers Paradise? The Gold Coast offers so much, it is a bit daunting unless you know what you really want. Check out the Gold Coast suburb by suburb guide to help you narrow down your search for where to base your holiday. Or search using my Gold Coast Map. You will find information on other Gold Coast suburbs, local attractions, travel information, tips and other accommodation ideas.